Yesterday I wrote about how interstellar clouds of methyl alcohol can be induced to create microwave laser regions (astrophysical masers). This was due to a stimulated emission of light in excited atoms. As strange as that seems, you can also have the opposite effect, or stimulated absorption. In 1969 a team of astronomers led by Patrick Palmer was looking at dark nebulae. These are dark clouds of gas and dust that are illuminated by some background object. They are largely seen not by the light they emit, but rather the light they absorb. So to study the composition of these dark nebulae the team were measuring the absorption lines of different molecules. The stronger the absorption lines, the more plentiful the molecule in the interstellar cloud. In this case they were looking at absorption lines of formaldehyde. 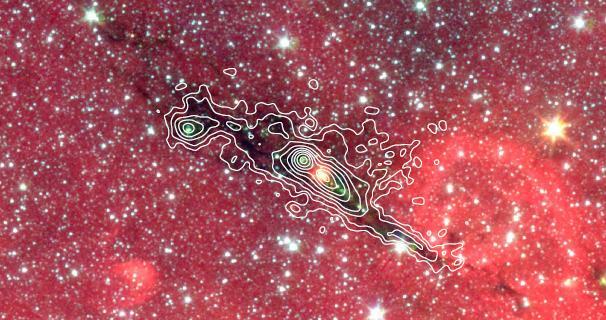 Formaldehyde is another simple molecule that exists in interstellar clouds. Astronomers often study their absorption lines because they are more easily detected than lines from other molecules. But they noticed that one particular absorption line was abnormally dark. Much darker than other similar formaldehyde lines. Since the other formaldehyde lines had levels that agreed with each other, the darker line couldn’t be due to an abnormally high concentration of the molecule. Instead, something must be inducing the molecules to absorb more light than usual. The effect soon came to be known as a dasar, or Darkness Amplification by Stimulated Absorption of Radiation. The term dasar brings to mind some kind of darkness laser or anti-laser, which is more than a bit misleading, and why the term isn’t used as much these days. But the effect is related to the stimulated emission effect of lasers and masers. In stimulated emission, the electrons of a molecule are induced into a higher energy level so that a photon with just the right energy can trigger the emission of more photons. In dasar case, the formaldehyde molecules collide with other molecules in the interstellar cloud, such as hydrogen, which removes energy (or cools) the formaldehyde gas. But the collisions take energy from one particular state much more than others. With lasers and masers, having a lot of electrons in energy levels that can be triggered to emit photons is known as an inversion. In the dasar case you get an anti-inversion. So instead of being eager to emit photons at a particular energy, the molecules are eager to absorb light at a particular energy, hence the abnormally strong absorption line. Because this absorption line is particularly strong, it is even easier to detect than other formaldehyde lines. This means it can be used to detect molecular clouds that are not strongly illuminated from behind. You can see this in the image above, where a dark cloud is seen against heated gas in the galactic plane. Recent work has even looked at the shadow of formaldehyde gas against the cosmic microwave background. Sometimes to see a molecular cloud you have to look into darkness.